Meow! Meow! What Does My Cat's Meowing Mean? Meow! Meow! What Does My Cat’s Meowing Mean? Cats rely more on their body language cues to communicate with other felines, but realize that they need to rely on “catspeak” to converse with people. And cats are straight talkers, delivering their meows with no attempt to confuse or deceive. Although dogs have been domesticated thousands of years before cats, felines are capable of making about 100 different sounds, compared o the 10 to 15 that dogs make. Some cats and some feline breeds (such as the Siamese) are chattier than others. The sound: A two-syllable meee-ooow is a demanding tone, especially if delivered loudly and repetitively. Cats mostly meow at humans, not other cats. What the cat is trying to say: He is making this long, urgent-sounding tone to make demands and to express displeasure. Or he feels stressed. A demanding cat may unleash the meow to convey disdain at being overly petted or if it is near dinner time and his person has ignored his sweet mews by the food bowl to be filled. Cats also meow when they are bored. 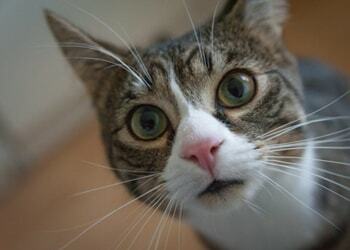 Beware if a usual non-verbal cat begins to up his meow vocals as this could signal an underlying medical issue. Finally, some senior cats wrestling with cognitive dysfunction may become confused and meow loudly at night as they attempt to navigate in the house. How to respond: Cats crave routines and seem to have built-in body clocks, so try to feed them at designated meal times or opt for a timed-feeder system to tone down the meows. Book an appointment to have your cat thoroughly examined by a veterinarian if his meows increase in volume and duration. The cat may be in pain due to a medical condition. The sound: This is a pleasing, short, high-pitched sound. What the cat is trying to say: Kittens meow, or mew, to their moms when they want to nurse. Cats will direct this affectionate sound to a favorite person as a greeting. Unlike the demanding meow, the mew is a polite vocalization that often charms the person on the receiving end. How to respond: Mews are special hellos from cats, so respond in kind by calming speaking the cat’s name and delivering an under-the-chin scratch or other type of affection. The sound: An elongated “s” sound that mimics that of a threatened snake. What the cat is trying to say: This is a clear message to back off. The hiss is an early warning sign delivered by a cat before he feels the need to defend himself by swatting or biting. And, highly agitated cats will also add a spitting sound to their hissing. How to respond: Heed the cat’s verbal warning and do not approach. Back away. Wait to connect when the cat has calmed down to avoid being injured by bites or scratches. The sound: A steady, soothing hum that mimics a well-oiled lawn mower. What the cat is trying to say: Cats are the only species capable of purring while inhaling and exhaling. Most of the time, cats purr when they are content and happy and wish to convey this to you. But cats also purr as a way to self-calm when they feel stressed (such as being in the veterinary clinic) or purr as a way to disguise weakness from perceived predators. Scientists are exploring theories that cats also purr as a way to heal bones or wounds by using frequencies between 24 and 140 vibrations per minute. How to respond: Accept the invitation by your healthy cat to spend some one-on-one time. Purring can also be therapeutic like meditation in some people. But if your cat is ill or old and begins to purr, it may be due to a medical condition that warrants consulting your veterinarian. By Arden Moore, a dog and cat behaviorist and certified master pet first aid/CPR instructor. Arden is a best-selling author, radio host and writer for Pets Best, a pet insurance agency for dogs and cats.